Marking the artist's first solo exhibition with the gallery, multi-disciplinary artist Lisa Bulawsky presents an exhibition of new works on paper titled "Everything Is Still Happening." Everything Is Still Happening exhibits Bulawskys recent and ongoing body of work, NP-C (amor fati). This is a series of collages that considers time as a broken lens, not linear or cyclical but kaleidoscopic. All works in the series are generated from elements of past studio works, invoking forgotten histories. Handprinted works are cut up and collaged onto inkjet prints of newsprint backing sheets  byproducts of the printmaking process. Each collage is a navigation of the terrain suggested by the newsprint image  the color, marginalia, and residue found there. Each collage is also an intervention into the past by current events, both inside and outside of the studio, in the time and place of their making  St. Louis, Missouri between 2015 and the present, 2018. 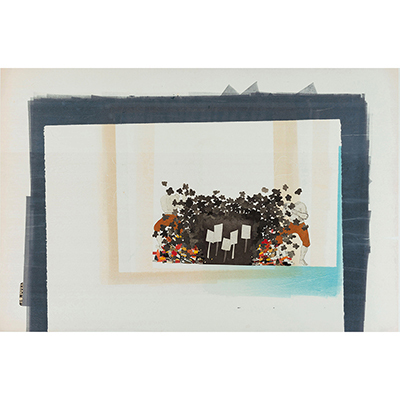 Lisa Bulawsky is a visual artist widely recognized for her works on paper, installation, and temporary public projects. Her works have been exhibited in the United States and abroad, including the International Print Center in New York, Swedens Dalarnas Museum, the Los Angeles Municipal Art Gallery, and the Urban Institute of Contemporary Art in Grand Rapids, Michigan. Her work has also been featured in Printmaking at the Edge (A&C Black, 2006), as well as Printmaking: A Complete Guide to Materials and Processes (Prentice Hall, 2009) and American Print Makers (Shiffer, 2014). Lisa Bulawsky (b. 1962, Sunnyvale, CA). She received her MFA from the University of Kansas, and a BA from the University of California, Santa Cruz. She is a Professor of Art at the Sam Fox School of Design & Visual Arts, Washington University in St. Louis, MO, and the Director of Island Press. She lives and works in Saint Louis, Missouri.